Maximize the value of your offline data by brining it online for digital activation. Signal makes it faster and easier than ever to bring offline data online to activate addressable media campaigns. In a matter of minutes, marketers can match offline customer data to digital IDs for targeting in the ad platform of their choice. Profiles created through Signal’s onboarding are persistent for dependable future use and always merging and matching new data for maximized scale. Audiences can be matched and distributed to DSPs in real time to power addressable campaigns across channels, devices, and inventory. Signal provides the ability to both build and amplify the online matches that are possible with an offline data file. We enable two levels of matching for onboarded files—a first-party match and a network match. 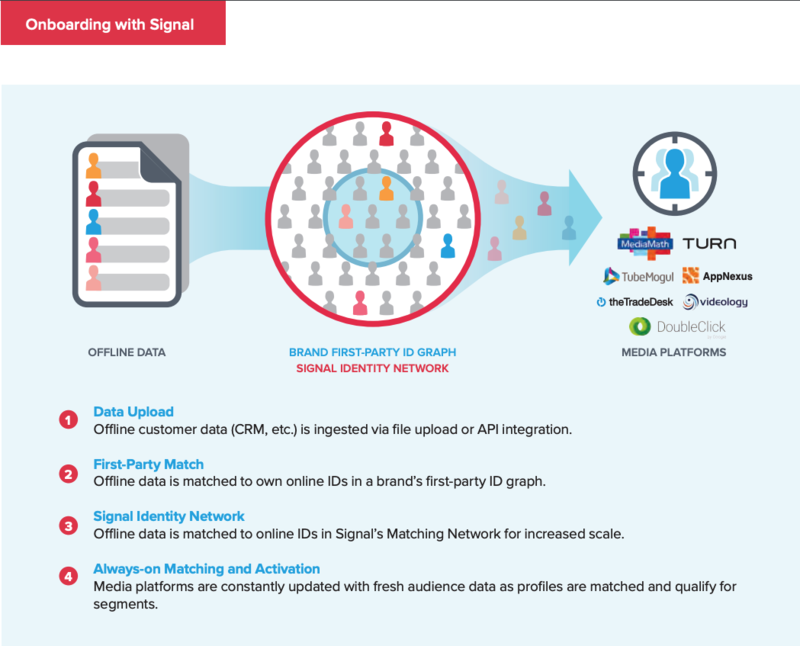 A first-party match connects offline data to a brands’ ID graph, which is comprised of data and hashed identities from across first-party channels. Signal‘s always-on recognition constantly searches, identifies and matches profiles as new data enters the system. To target more of your known customers, match offline customer data to Signal’s Identity Network–an independent collection of anonymized identities from Signal’s direct publisher and data partners. The Identity Network enables greater first-party addressability with access to over 300MM+ unique ID matches to resolve customer identity across channels and devices in real-time at scale. Onboard all customers once and create a persistent profile that unifies all data around a holistic customer view. Continuously update data from online and offline customer touchpoints to engage consumers when they’re in market for products rather than days late. Activate customer profiles through seamless, real-time syncs with DSPs, DMPs, media properties, and content delivery platforms. Leverage our graph reporting to perform closed-loop measurement and analysis at the user level for deeper insights and attribution.